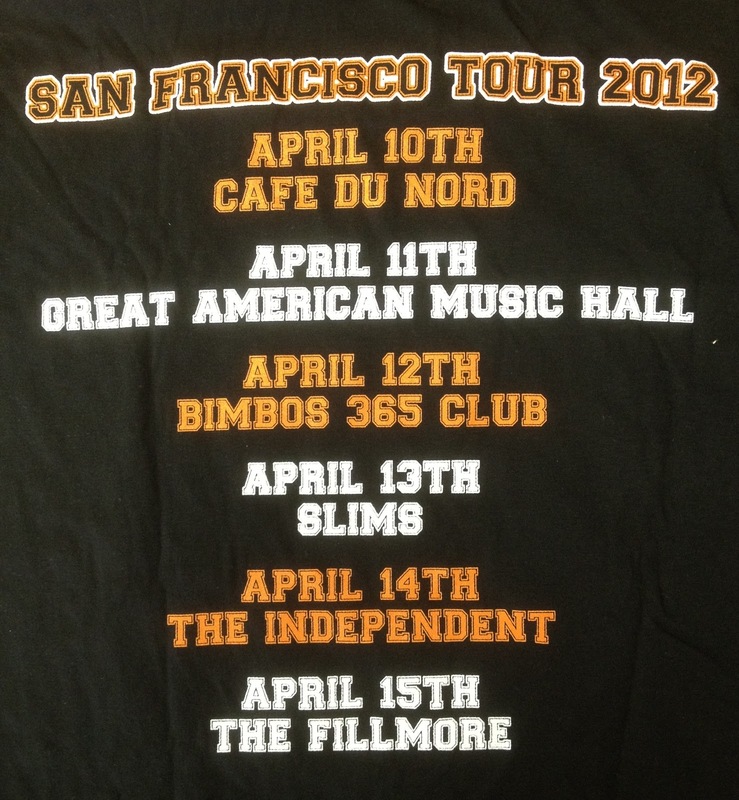 Back in February I heard that Train was going to play a San Francisco-only tour consisting of six concerts in six nights at six local clubs - the Café Du Nord, the Great American Music Hall, Bimbo’s 365 Club, Slim’s, the Independent and the Fillmore. As soon as tickets went on sale I logged in and found that every show was sold out except for the April 10th show (the first night) at the Café Du Nord which was fine with me since I love that venue. It is the smallest of all of the venues Train was planning to play. I read the capacity at the Café Du Nord is around 350. My wife was really excited that I got tickets and so we braved the rain last night to head into the City to watch one of our favorite bands in a tiny club. 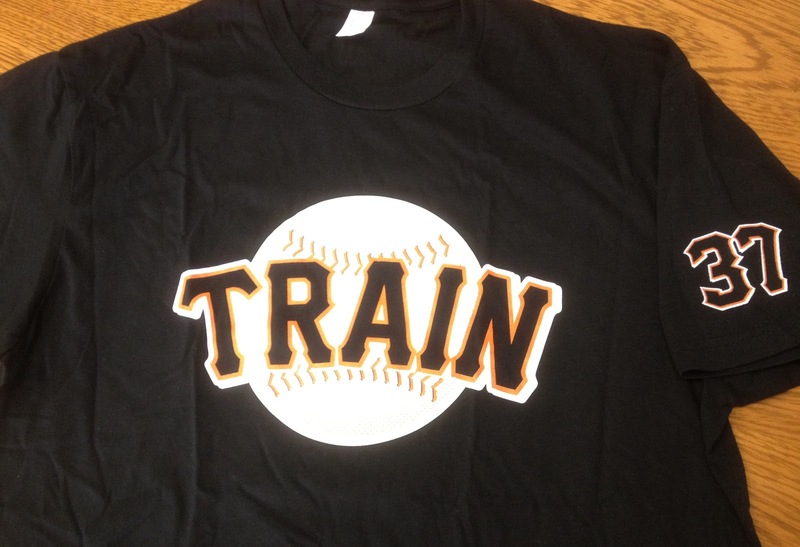 We saw Train last year at the Sleep Train Pavilion (my daughter's first concert - Train, Maroon 5 and Matt Nathanson) so I sort of knew what to expect. 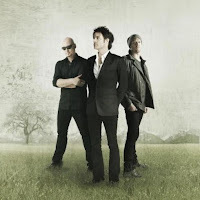 I like Train, my wife and kids LOVE Train and I always like to see bands in small venues. The opening act, Jeff Campbell, played a solo guitar set of around 8 songs (or so). My wife and I enjoyed his set and I plan to seek out his music. Here's what I read about Jeff (from the Café Du Nord website): "A Philadelphia native, Campbell moved to San Francisco in 2004 specifically for the Rock scene he had heard was developing. It was here that, in addition to his solo efforts, Campbell started writing, recording and performing as front man for the San Francisco-based rock band Pine and Battery, who still can be heard in regular rotation on both AAA’s KFOG and KQED radio in the San Francisco." Read more about Jeff here. After some sound check tweaks it was showtime. Pat took the stage alone for "California 37". The rest of the band emerged for "This Will Be My Year". They played a fantastic set that was comprised of tracks from their new album and tracks from years past (as you can see above). Pat played sax on a couple tracks and harmonica on another. He kept the crowd chuckling as he complained of not remembering the lyrics to the new songs (and some old songs too). The band is a lot of fun to watch and having seen them in a LARGE venue last year it was a real treat to see them at the Café Du Nord. The San Francisco love was flowing and I can't resist a band that loves my City by the Bay as much as I do. 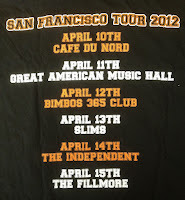 I had to purchase a t-shirt - I mean, really...a Giants nod as well as a shirt with only six dates listed on it. Have a listen to Train's new album, "California 37" streaming here. "California 37" will be released April 17th, 2012. THANK YOU, TRAIN... you guys are TOPS with me.